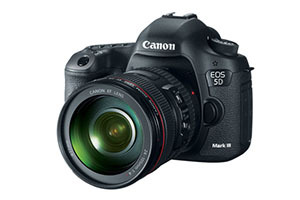 Canon today announced a new DSLR camera. 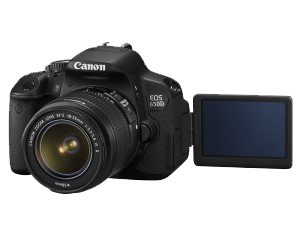 The 650D/Rebel T4i is a 17.9 mega pixel follow-up to the EOS 600D/Rebel T3i and adds a touch-screen rear LCD, faster 5fps burst rate, smoother and more accurate autofocus tracking during video capture. 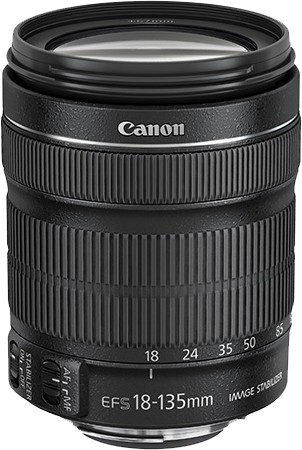 Similar build and weight to the 600D/Rebel T3i. 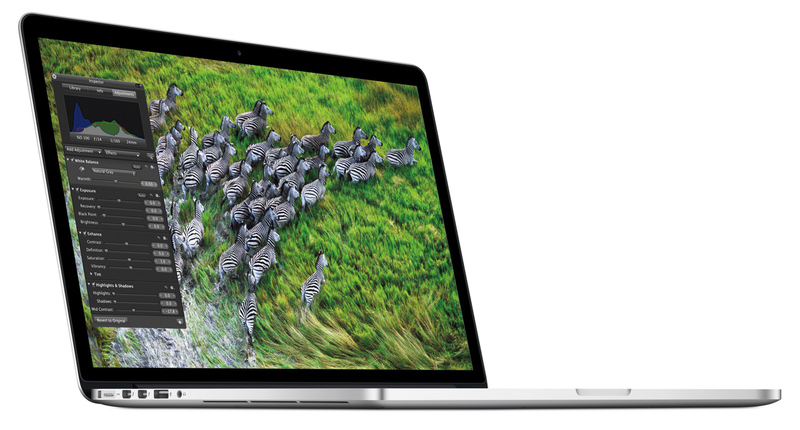 APS-C (22.3 x 14.9mm) sized, 1.6x crop, 17.92 million pixel sensor. Self-cleaning sensor incorporates phase detect AF points to improve autofocus performance during live view and video recording (similar to the solution first introduced by Nikon in the mirrorless J1/V1 cameras). 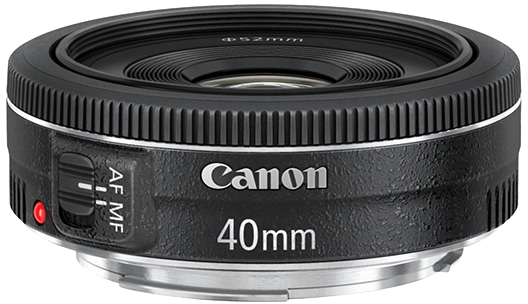 Effective image size is 5184 x 3456 pixels. 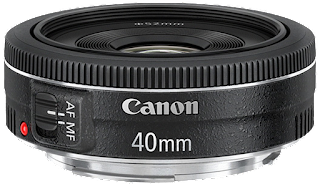 Compatible with both EF and EF-S lenses. Maximum frame-rate of 5fps with a buffer size of 30 Large/Fine JPEG, 6 RAW, or just 3 RAW+JPEG frames (when used in combination with a fast UHS-1 card). ISO range of 100-12,800 (25,600 in H mode). 9-point AF system. All 9 points are cross-type, the centre point add precision when an f/2.8 or faster lens is used. New pentaprism viewfinder with 95% coverage. Built-in flash that can act as a wireless TTL controller. New in-camera processing option allows you to blend four high ISO pictures taken of the same scene, reducing final noise considerably. Audio from the built-in stereo microphone or optional external stereo microphone. 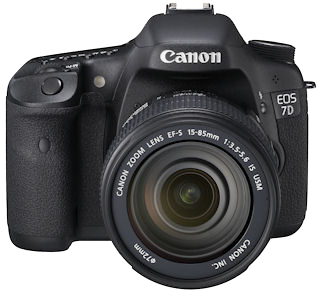 According to Canon, the new 650D/Rebel T4i will begin to ship at the end of the month at a price of ±$850 (€ prices not known yet but are expected to be similar). 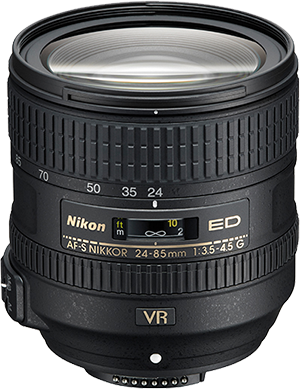 Photographers, and especially wildlife and sports photographers with their long lenses, have a lot of gear to carry. When you have to carry it a long way, or for a long time, this can become very tiresome. 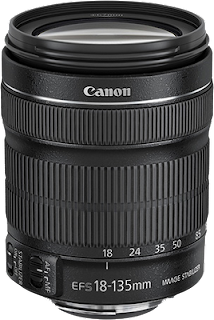 So with a trip to the Bavarian Forest planned (where I really wanted to take both my 200-400mm and 600mm lenses), it was about time I had a look at some of the available carrying options. Limit the amount of gear to take, take only what I really needed. Great, but for this trip I was really going need my all long tele lenses, tripods, and bodies. Prevent having to walk far/long with the gear. Take everything in the car and have it close. Ask an assistant, partner, or friend to carry some of the stuff. Great option, but I don't always go everywhere with an assistant/partner/friend. Plus, this won't work if he/she is already carrying (heavy) gear of their own. Use a cart to carry the gear. Hmm, interesting option, perhaps this would work! 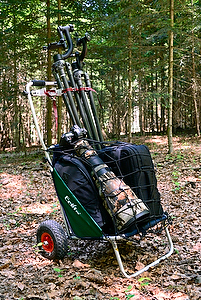 To be any help, to the burdened photographer, a “cart” should be a) lightweight, b) easy to transport to and from location in e.g., a car, c) sturdy and rugged, d) low maintenance, e) suitable for almost any terrain, ranging from paved roads to uneven and difficult terrain like loose sand, forest floors, and mountains, f) able to carry all my gear, g) flexible in use (e.g., easy to access, stow, and use the gear), and, finally, h) not too expensive. 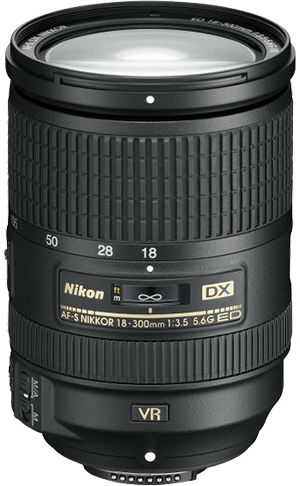 So I went to the websites of my favourite camera stores to see whether or not they had it in stock, and for what price. At ±€100, the Beach-Rolly is actually quite affordable and having looked at the available options, I decided to go for the Blue/Green version without a sunroof (I didn't expect to use this ever and if I really missed it, I could always buy one later). 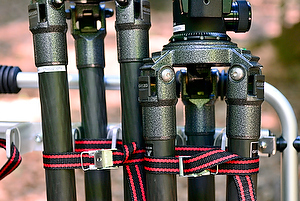 I also ordered the tripod holder and cargo net accessories as I deemed these very handy. The next day, I received my order (it was in stock) and I immediately put the Rolly together. As it turned out, this was a breeze, with only a couple of things to put together this was a quick and easy thing to do. So now on to using the thing! As it was still a while before my actual trip to the Bavarian Forest, I first tested the Beach-Rolly locally. Loaded with my camera backpack, 600mm (I didn't foresee the use of my 200-400), and tripod, I set out to photograph some local wildlife. The Beach-Rolly behaved very well under these relatively easy circumstances with (mostly) paved roads, giving me high hopes for the real test in the Bavarian Forest. I was not disappointed! Even loaded with two tripods, a full camera backpack, and both the 200-400mm and 600mm lenses, the Beach-Rolly proved a very good companion and had no problems with the sometimes quite uneven terrain. Sure, lugging 20+ kg of gear up a steep hill is still no breeze, but infinitely better to handle than carrying everything by hand/on your back. In other words: I'm Very happy with the Beach-Rolly! 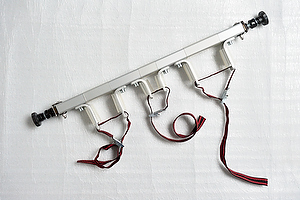 a) Weight – Weighing only about 4kg, it is indeed a pretty lightweight solution. b) Transport – For transportation you simply fold the “seat”, flattening the whole thing to ±125x75cm with just the wheels sticking out. If you want it smaller, you can fold the handlebar as well, reducing the size to ±80x75cm. And if that still isn't small enough for you, you can also easily remove the wheels, leaving the two wheels and a flat package of only a couple of centimetres thick. This should allow it to fit into the boot of even a very small car. Efficient as I always strive to be, I actually simply fold the seat of the Rolly and put it behind the front seats of my (none too big) car. This allows me super quick loading and unloading. So, full score on this requirement! c) Quality – The Beach-Rolly is well made, with a built quality we come to expect from Germans. I only found its creaks a bit when you pull it forward. Not a real issue I'd say. 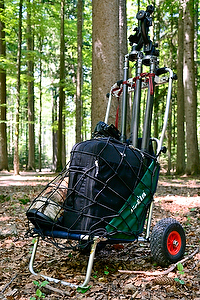 d) Terrain – I had no trouble pulling the cart and keeping it stable on the sometimes quite uneven terrain of the Bavarian Forest. And while I haven't yet tried it on loose sand myself, I've seen it works very well there too. Again full score here. e) Capacity – As mentioned, the Beach-Rolly easily held my two heavy tele-lenses as well as a full camera backpack. f) Maintenance – With little moving parts and a simple design, I can't see much requirement for general maintenance, other than keeping it clean. The wheels are sturdy, but even if they wear out a replacement wheel can be obtained and fitted easily. g) Ease of Use – The Beach-Rolly allowed me to have a camera mounted on the lenses, ready to be used. Excellent! h) Price – Costing just below €100 in the Netherlands, the Beach-Rolly is not overly cheap, but certainly not very expensive either. Together with the Beach-Rolly I also ordered the cargo net and tripod holder. Both I can recommend wholeheartedly. 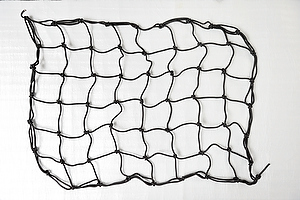 The cargo net is very easy to use and keeps your gear safe, and on the cart. It's usefulness (read: necessity) proven already: The one time I forgot to fasten the net over my gear I walked for only a couple of meters before I heard a noise and found my 200-400 + camera lying on the floor. Luckily they didn't fall very hard and suffered no damage. So in my opinion, the cargo net is a must have. Sure you can fasten your gear with other means too, but this is just so easy to use. At first I didn't really like the tripod holder (officially called the Multi-Holder), but after finding the best way to use it, I can now recommend it too. The trick is that you need to extend the legs of your tripod so that they fully reach the position of the holder on the bar. That way the tripod fits snugly and can be easily secured. Besides the cargo net and tripod holder, you can also fit the Beach-Rolly with a sunroof, neck rest (you can also use the Beach-Rolly's loading area as a chair), bottle holder, or additional loading bar to extend the loading platform. 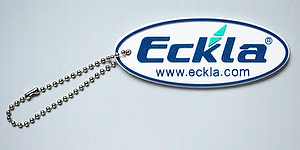 If this all isn't enough versatility, Eckla also offers the Multi-Rolly, basically a Beach-Rolly without the side skirts, but with an additional chair at the back of the cart. The Beach-Rolly is a great solution for photographers carrying heavy equipment over difficult terrain. It is no wonder that almost all the photographers with bigger lenses that I met in Bavaria used a Beach-Rolly for transportation! 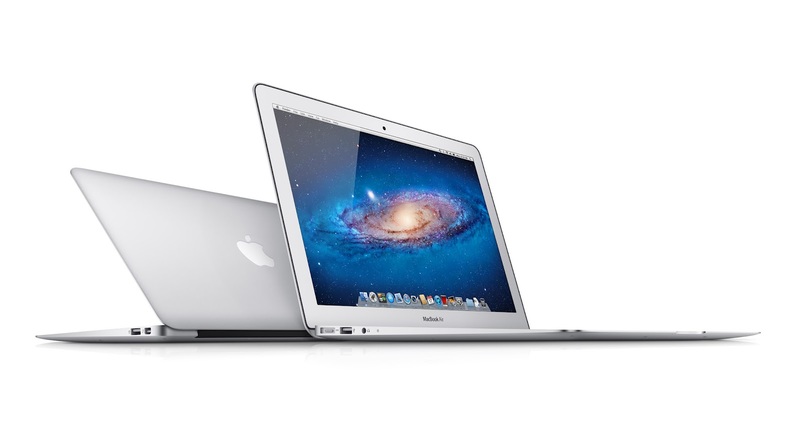 Adobe released a security update for Adobe Photoshop CS5 & CS5.1. The update addresses vulnerabilities that could allow an attacker to take control of the affected system when a user opened a malicious TIFF or DAE file in Photoshop CS5.1, Photoshop CS5 (or earlier!). While Adobe is not aware of any attacks exploiting these vulnerabilities, I would suggest you do download and install this update at your earliest convenience! The update exists for both the Mac and Windows versions of Adobe Photoshop CS5 and CS5.1. If you are running Adobe Photoshop CS6, this issue does not apply and there is no need to for an update. You can find the update at Adobe's own Photoshop Help website. This update resolves a use-after-free TIFF vulnerability that could lead to code execution (CVE-2012-2027, Bugtraq ID 52634, which references www.securityfocus.com/bid/52634/). This update resolves a buffer overflow vulnerability that could lead to code execution (CVE-2012-2028). This update resolves a stack-based buffer-overflow vulnerability in the Collada .DAE file format that could lead to code execution (CVE-2012-2052, Bugtraq ID 53464, which references: www.securityfocus.com/bid/53464/). This update applies to all languages, except Middle Eastern, North African French, and Greek. The 12.0.5 and 12.1.1 updates address only this security vulnerability. This issue does not exist in Photoshop CS6.